The 3D revolution first came about back in 2010 when Samsung launched its pioneering range of three-dimensional TV sets to the world. Since then, the market has grown steadily, with an estimated 1.3 million 3DTVs thought have been sold in the UK alone. With 3DTV’s sitting in the households of growing numbers of people, is this new technology likely to ever fully replace the traditional 2-dimensional boxes we have become so accustomed to? And what is in store for the future of the TV and broadcasting industry? The recent 2012 British Olympics saw the first ever live 3D broadcasting of the games, with broadcasters such as NBC, CCTV, BBC, Nine Network, Eurosport and Sky 3D all taking part in the 3D broadcasting. In the UK alone over 113,000 people watched the London 2012 opening ceremony in 3D, and although representing only a small proportion of the record breaking 27 million UK viewers, 3D TV production was certainly starting to make in-roads into the mainstream market. On a similar vein of thought, it is interesting to note that David Attenborourgh recently became the first man to win a BAFTA in black and white, colour, HD and 3D formats. Such facts and figures seem to suggest that 3D TV production is on the rise, and perhaps even provides a glimpse of what the future might hold for media jobs. People who work in TV, and have had any exposure to 3D broadcasting, will be well aware of the challenges that are faced in producing 3D broadcasts. In comparison to 2D broadcasting, 3D broadcasts are much more complex and expensive, requiring a very high technical standard to be maintained throughout the filming process in order to prevent any mismatch in colour, alignment, or focus between the two cameras, that may destroy the 3D effect or produce discomfort for the viewer. Critics of 3DTV often point to the annoying glasses and the lack of depth and excitement compared the immersive visual world that you would experience at the cinema. 3DTV has even recently been linked to the cause of certain health issues. In 2012, Sony, Toshiba and LG unveiled their latest answer to home entertainment: 8K – or “Super Hi-Vision” (SHV). SHV is the equivalent of sixteen times the resolution of current HD, and is thought could cause considerable threat to 3D, with many people believing this is where the future of TV truly lies. One of those people is BBC Director of Sport Barbara Slater, who supervised the 3D broadcasts and SHV experiments in London for the Olympic Games. Barbara was quoted to have said: “3D never really caught fire, it wasn’t talked about. We are proud of the opportunity to show some 3D coverage but it was not something that really resonated.” This was demonstrated by the fact that the men’s 100 metre final was watched live by 20 million people in the UK but only 66,000 of them tuned in to watch it in 3D. SHV on the other hand reportedly wowed audiences at public screenings during the recent Games. “It made you think – My goodness, I am seeing the future of broadcasting”. Others believed that at that scale and resolution, there is so much information and detail before your eyes that you could have a different experience watching the same video depending on where you chose to look. 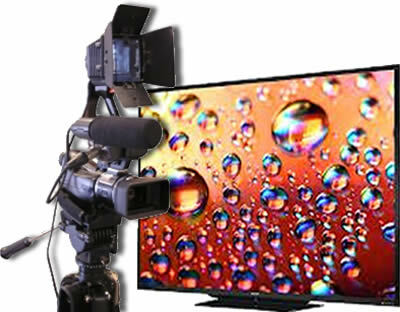 The enormous price tags and limited SHV TV production makes the current threat of 8K technology less significant, however as technology and production prices fall, consumers and broadcasters will undoubtedly follow, and this is where the industry will go. The future of broadcasting therefore lies in SHV, not 3D. Author Bio: Oliver specialises in technology, gadgets, and social media. He spends most of his time buying and testing gadgets, learning about technology and wondering about future technologies. All images and data in this article are used courtesy of Real In Media. 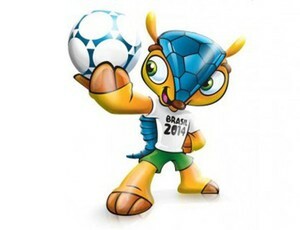 The 2014 FIFA World Cup, which will see 32 of the world’s best national football teams descend on Brazil for the 20th edition of the quadrennial tournament, will much like the 2012 Olympic Games be seen as a breeding ground for many innovations in sports broadcasting, but it appears as though one of the first confirmed developments will be occurring outside of the host nation or tournament organisers such as FIFA, as Japanese authorities confirm plans to air select matches of the event in the new 4K resolution format. While national public broadcaster NHK had previously offered its assistance in public screenings of the 2012 Olympic Games in ‘Super Hi-Vision’, and provided their unique simultaneous ‘surface/underwater cameras’, it is the Internal Affairs and Communications department of the 126m-strong Asian nation that has confirmed the new proposals. While the international feed of the tournament will most likely be used for footage, the department claim that they will broadcast the event to Japanese citizens through their own specially-made communications satellites that can handle full 4KHD-quality transmissions (named after being able to fit a screen over 4,000 pixels wide, also noted as 4 times higher-quality than regular HD), as opposed to ‘standard broadcast satellites’. While it is unknown how many matches from the FIFA World Cup will be covered this way, or how readily available 4K coverage will be elsewhere in the world, the announcement symbolises Japan’s commitment to the development of 4K HD technology, and will most likely be working on the matter alongside home-grown company Sony, an official FIFA Partner and FIFA World Cup Sponsor who will presumably be filming the tournament in 4K cameras and downscaling to HD or SD for networks around the world. However, it seems as though at least one country will be taking on the highest-quality coverage possible, but on the pitch will Japan’s national football team (who are participating in this summer’s 2013 FIFA Confederations Cup in Brazil, an 8-team tournament of continental champions that will serve as a ‘warm-up’ for the World Cup organisers) manage to continue their 4-tournament qualification streak for the event and give local viewers extra motivation to try out 4K viewing? Nearing the realisation of their plans alongside Japanese national public broadcaster NHK (with commission from the OBS (Olympic Broadcasting Service)), the BBC have announced the details of their trial ‘Super Hi-Vision’ coverage of the 2012 Olympic Games in London (England), a picture quality noted as being 16 times higher resolution to that of regular HD. 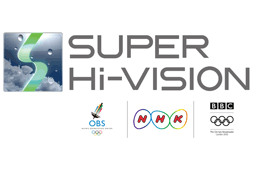 Aimed to air for slightly longer than the duration of the ‘Games Period’ (beginning on 23 July, 2 days before the first event, and ending with the Closing Ceremony on 12 August), Super Hi-Vision will be shown in its host’s broadcasting market across three venues, with BBC Broadcasting House in London (England), BBC Pacific Quay in Glasgow (Scotland), and the National Media Museum in Bradford (England) all set to show the footage collected, with ticket sales being run by the relevant organisations (BBC and National Media Museum). In addition, NHK were not likely to provide their technology without offering their viewers back in Japan a chance to watch on big screens, with venues in Tokyo and Fukushima selected, while a taste of the highest-quality London 2012 clips will also be available to watch in Washington DC (USA). The ‘special public viewing theatres’ are currently being built with screens to support the 7680 x 4320 format, alongside ‘speaker rigs’ that will provide 22.2 multichannel sound. Broadcasting live coverage of both Opening and Closing Ceremonies, along with the Men’s 100m final and a full day’s session from the Aquatics Centre, as well as filming elsewhere (at the Velodrome and Basketball Arena as well as the Olympic Stadium and Aquatics Centre) for highlight packages, the coverage will be seen as the first ever large-scale application of the fledgling Japanese technology. Current activity from the team has seen filming for the ‘preview’ coverage has already begun, with the BBC taking the Super Hi-Vision cameras (the only of their kind in the world) and shooting footage of a number of London landmarks in preparation for their launch next week. While the Olympic Games are a notable breeding ground for emerging broadcasting technologies, will the broadcast of Super Hi-Vision signals in 3 continents give one of the most global world events a higher global standard in picture quality? The BBC have revealed that three cities in the UK will get a chance to witness a new level of viewing technology next summer, as the public broadcaster reavealed their plans to operate big screens during the 2012 Olympic Games featuring Japanese-innovated ‘Super Hi-Vision’. This new technology is said to have a picture that is 16-times clearer than regular high definition (which itself is up to 6 times sharper than standard definition). BBC’s head of Olympic broadcasting Roger Mosey added that while news on live 3D coverage (both public and private) will come nearer the turn of the year, viewers in Bradford (England), Glasgow (Scotland), and Olympic Host City London (England) can look forward to 600-inch screens airing live coverage throughout the 17 days in July & August. The development has been an innovation of Japanese public service broadcaster NHK, who are teaming up with the BBC for a platform to showcase their new technology, with ‘Super HD’ coverage expected to include the opening ceremony (highlights only), and selected live events throughout the games. The Super Hi-Vision screens are currently in the process of being produced in Japan, and are already being advertised as capable of supporting a 4320 x 7680 pixel signal (compared to the current TV maximum of 1080 x 1920), with a potential of 120fps (though the transmissions next summer will run on around half that). The move follows a previous partnership between BBC and NHK, after a first-ever broadcast of Super Hi-Vision was achieved in September 2010, when a concert by The Charlatans was aired between London and Tokyo. Since then, the pair have managed to compress the connection speed needed for transmitting video signals (from 24Gbs to 350Mbps). The BBC are stating a belief that Super Hi-Vision can become a ‘better long-term prospect’ than 3D broadcasting depending on further reducing production and operation costs, though NHK believe they can achieve this (and bring Super Hi-Vision to home use in Japan) by the year 2022. The relatively slow growth of 3D is noted by the BBC, who claim that their coverage of the 2012 Olympic Games will require a key balance between ‘minority’ innovation such as 3D (the recent experiment of Wimbledon Tennis in 3D drew a peak of 140,000 viewers), and the more mainstream coverage, including, digital, HD, online and interactive services. The broadcaster recently stated that they intend to broadcast every event: “From first thing in the morning to last thing at night.” With up to 24 live online streams available to users of desktop, smartphones, and tablet computers through a newly-designed website. 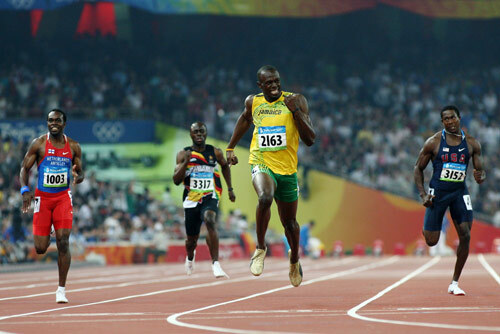 Regarding 3D and Super HD, though it is not the first time that the Olympics has been used as a platform for broadcasting innovation, with a potential global audience seen as the perfect chance to premeire features such as televised events in colour (1948 in London (England)), HD filming (1984 in Los Angeles (USA)), and trials of 3D (1992 in Barcelona (Spain)). 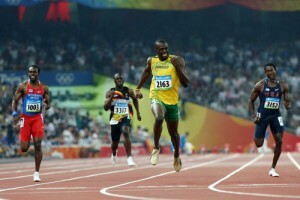 With the 2012 Olympics likely to witness athletes attempt to push the boundaries of their sports to new limits (with the world especially wanting to see dominant Jamaican sprinter Usain Bolt break his 100m record (9.58 seconds)), will similar efforts be seen in the broadcasting technology studios next summer?